Nelson Bostock Unlimited owner Creston has reported a two per cent rise in full-year pre-tax profit to £9.9m, as it continues its acquisition programme by buying a 27 per cent stake in advertising firm 18 Feet & Rising for £1m. Creston CEO Barrie Brien: "Encouraged by the early successes in our new strategy"
Revenue grew three per cent to £76.9m in the year to 31 March, with Creston saying it was "encouraged" by the performance following the new company-wide strategy and rebrand. 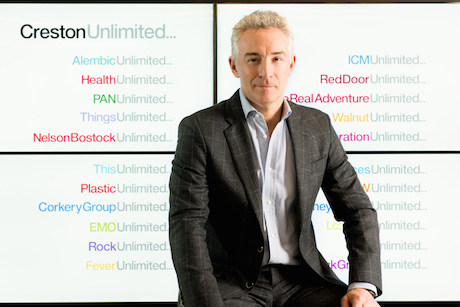 Creston, which also owns Fever Unlimited and Red Door Unlimited, said London-based 18 Feet & Rising would be rebranded as 18 Feet & Rising Unlimited, in common with Creston’s approach of adding the 'Unlimited' suffix to its businesses. The business was founded in 2010 and produced revenue of £2.4m in 2014. Its clients include Allianz, Cuprinol, Kopparberg, Nando's, House of Fraser and Skoda. Creston CEO Barrie Brien said: "Its brand-building creativity, combined with in-depth understanding of the digital world, will give us a truly compelling offer for our clients." It follows Creston’s acquisition of a 51 per cent stake in digital design consultancy How Splendid in April. As part of Creston’s five-year strategy, announced last year, the firm is seeking targeted investments, acquisitions and partnerships. This has also seen partnerships developed with US-based Propeller Comms, European marketing comms agency Serviceplan and The Digital Consultancy. In the year to 31 March, revenue at Creston’s Communications and Insight arm grew five per cent to £56.2m. Headline profits before interest fell from £8.3m to £8.1m in the division. The company cited the adverse impact of the weakening Euro in the second half on a few Euro-based revenue contracts, plus temporary additional freelancer costs incurred following a "strong new business performance". New business wins in the division during the period include work for new and existing clients such as Activision, Allianz, Arthritis Research UK, Asda, Barilla, Bentley, Deezer, McCarthy & Stone, McLaren, Mind Candy, Sainsbury's Energy, Sky, Sony Mobile, Superfast Broadband and Vue Cinemas. Wins since the year end include Costa, plus further assignments from Canon. Revenue in the Health arm fell three per cent to £20.7m, or four per cent on a like-for-like basis. On a constant currency basis, the decline was two per cent (like-for-like: decline of three per cent). Headline profit before interest and tax fell four per cent to £4.3m. Preston said following first-half revenue growth of six per cent, third-quarter revenue was impacted by some client budget cuts and project delays within the UK health business, which also affected Q4 revenue. New business wins in the period include work for Abbott, Baxter, Bayer, Danone, International Aids Society, Parent Project Muscular Dystrophy and Unilever. It also expanded its remit with existing clients including CDC, Novartis, National Meningitis Association, Pfizer and Sanofi. Overall, Creston reported an 11 per cent rise in headline diluted earnings per share to 13.07p. Dividend per share rose eight per cent to 4.2p. At the year end, the firm had net cash of £8.3m, up from £7.5m at the previous year-end. Creston’s new group strategy saw the launch of the Creston Unlimited brand in November 2014. The strategy had five key parts: to build an agency group brand; develop a group full-service client offer; develop its consultancy offer; invest in existing companies' offer and services; and grow international services. Brien said: "One year into our new five-year strategy there is a real feeling of momentum and energy across our group. A fantastic team effort has seen us achieve a huge amount in the past 12 months. The launch of a new group brand and offer, a group-wide rebrand, three acquisitions and four partnerships have all been delivered alongside award-winning work for our global clients, a strong new business performance, growth in our financial results and an increased dividend to our shareholders. "We are encouraged by the early successes in our new strategy, which give us a strong platform to deliver value to shareholders over the medium term." Last week Creston announced the departure of longserving non-executive director Andrew Dougal and the appointment of Nigel Lingwood, currently finance director of technical services firm Diploma, to a similar role.